Twirly and swirly, this pleated midi skirt can't wait to go to a party and show off its swishiness. It's made from silky so-soft velvet and has an all-over spot print that has festive fun written all over it. The sparkly striped waistband is the icing on the (Christmas) cake. Who's ready for the school disco? 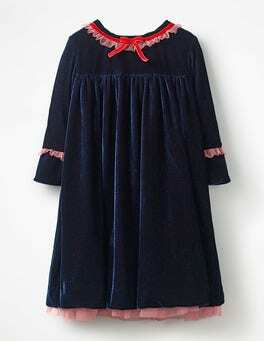 With a full tartan skirt – lined with layers of cotton and tulle – this dress is. 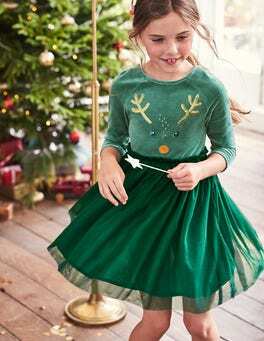 The soft velvet bodice has a sparkly metallic waistband for an extra dose of festive magic. Now, where's that DJ? …ahead? This T-shirt – complete with flouncy velvet peplum – is here to save the day. The loose, swing style means it can be dressed up for parties or down for a walk in the park. It's crafted from heavyweight soft jersey fabric, and even has a handy velvet pocket. See you Monday, school uniform. 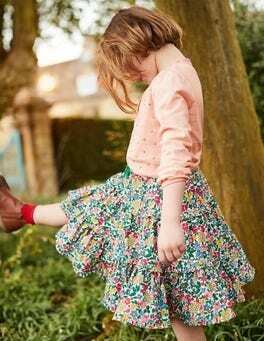 When it's time for a party, you'll be ready to twist and shout with this twirly skirt. The layered frills will show off your daring dance moves, while the velvet drawstring waist ensures you can groove away in comfort. Playful prints and pretty little bows add even more fun. …a zebra and a rainbow? We’re thinking something pretty close to this stripy dress. 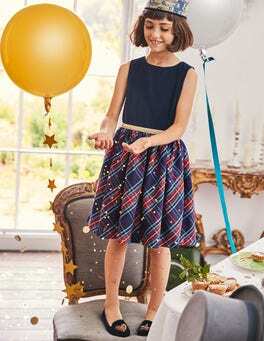 Crayon-bright colours in sparkly threads slice through a black background, while the full, lined skirt and velvet waistband make it ready for the party. So, will it be off to the zoo, or to find that pot of gold?